A very insightful interview conducted by Darren Cunningham with Naresh Govindaraj, the brainchild behind Informatica Cloud’s Integration Templates. Learn why templates are important in today’s world of mashups and composite applications. A blog post I wrote on the Informatica Perspectives blog on how iPaaS impacts cloud application adoption. How can Cloud Data Quality Lead to MDM? I recently attended a joint panel webinar between Informatica Cloud, StrikeIron, and Address Doctor (a subsidiary of Informatica Cloud) discussing Informatica Cloud’s latest service from its Winter ’12 offering, the Contact Validation Service. I also learned of the 1-10-100 rule – a Bloor Research whitepaper that states that it takes $1 to verify a record as it is entered, $10 to cleanse and de-dupe it and $100 if nothing is done, as the ramifications of the mistakes are felt over and over and over again. Contact Validation ensures an abundance of benefits for all departments and industries. Marketing functions can benefit from higher campaign response rates by filtering out leads with incorrect contact information – in fact, a BtoB Online article claims that validating and managing data in the earliest stages of collection can lead to better lead scoring and lift conversion rates by about 25% between the customer inquiry stage and the point where marketing qualifies the leads. In addition to marketing, warehouse managers can calculate correct shipping costs and legal departments can ensure regulatory compliance. Industries such as Insurance can use geocoding information to check whether properties are near a fault line, flood plain, or landslide zone, while banks can use contact validation in their deduping process. With 30% of people changing their email every year, invalid emails can trigger bulk email flags, causing future emails to be filtered as spam, and result in the sender being blacklisted by ISPs and spam filters. This is why email validation is so important. The $16,000 per violation fine from the FTC also underscores the importance of phone validation against the Do Not Call registry. I also learned that Contact Validation fits into the Data Quality spectrum, and is only a small part of it. But before even embarking upon a data quality project, it’s important to first of all integrate all of your data. Then, the next step is to cleanse, enrich, & augment contact data as a first step towards achieiving higher data quality. Once this is done, parsing and standardization, deduping, and finally monitoring and reporting round out the rest of the data quality activities. Moreover, these data quality activities must be done for all data types, and not just contact data. With data quality processes properly implemented, a company can then finally take it to the next level and develop data governance policies, and hierarchy management for a full-fledged Master Data Management Solution. You can view the full replay of the webinar below. A couple of weeks ago, I witnessed a very interesting webinar panel discussion around people’s experience around data integration in the cloud. The panel was moderated by Jeff Kaplan of THINKstrategies, an analyst firm and the panel members included Andrew Bartels of PSA Insurance & Financial Services, Tom Carlock of Dun & Bradstreet, Aaron Mieswinkel of Astadia, and Darren Cunningham of Informatica. I found this collection of panelists especially interesting because they represented constituents from several ends of the data integration spectrum – PSA was a consumer of cloud data integration services, Dun & Bradstreet was a provider of data quality services, Astadia was a System Integrator with deep experience in salesforce.com cloud integration, and Informatica was an ISV that specialized in out of the box data integration and application integration software. On the SaaS vendor side, a THINKstrategies survey found that 88% of SaaS companies identify integration as important in winning new customers and a common sales hurdle. These predictions seem quite telling about the main obstacle towards moving to the cloud – data integration. Many CIOs are still hesitant towards moving to the cloud because they believe that doing so would result in a massive strain on IT resources when it came to data integration, that the cost savings for moving to the cloud itself would be shot. In the first wave of cloud computing adoption, businesses merely used companies such as Amazon Web Services for testing and development of their applications. CRM, and email then followed in the second and most recent wave of cloud adoption. However, when it comes to the third wave of cloud adoption, of moving mission critical systems such as ERP or proprietary financial applications to the cloud, there is still resistance to the idea because of the complex nature of these deployments. This is where cloud data integration plays a huge part in taking away the complexity of integrating these various on-premise and cloud applications. When you have your systems on separate islands, it is extremely hard to benefit from the real-time BI that cloud computing can offer. Cloud data integration that can be done without the aid of IT personnel, while still following the procedures and rules around IT governance is the solution towards achieving real-time insight into your company’s operations. for cloud analytics, data-as-a-service (a.k.a. DaaS), and PaaS. Accelerating PaaS adoption is an area I’m especially interested in, given some work I’ve done in this space with past companies. A lot of application development in the cloud still takes place on two ends of the spectrum – on one end, there are developers who use a cloud application (such as salesforce.com) and need certain customizations built into it – they then use force.com to perform those customizations. In other instances, you have indie developers who use Windows Azure, or VMware’s Cloud Foundry to develop “nice to have” applications from scratch. But by and large, mission critical application development still occurs on-premise. I strongly believe that cloud data integration that can be performed by non-technical business users, will leave more time for IT personnel to develop mission critical applications in the cloud. With the PaaS space gaining more importance, and consolidating further, the time is ripe to take PaaS development to the next level. This in-turn will lead to cloud data integration morphing into “iPaaS” (or Integration Platform-as-a-Service). This interdependence between iPaas and PaaS will eventually lead to true SOA where we have open systems working hand-in-hand with each other, all in the cloud. You can view the entire webinar below, and also check out Hollis Tibbetts blog on cloud data integration. LinkedIn – the defacto SaaS recruitment software? LinkedIn has grown tremendously since its humble beginnings in 2003, when it started with about 4,500 members in its network. It now numbers over 80 million members and has launched a variety of premium services to monetize its technology, in the area of Advertising and Recruiting. Of these, its Recruiting solutions (known as LinkedIn Talent Advantage) offers an interesting portfolio of capabilities that rival a multitude of job boards (such as Monster and Dice), as well as SaaS vendors such as Taleo. An insightful post by a seasoned recruiter shows that 1 in 20 (or 5% of) LinkedIn profiles are those of recruiters in the U.S. Assuming similar trends hold worldwide, LinkedIn has potentially 4 million recruiters worldwide to market its premium services to. 1) LinkedIn Recruiter: Recruiters can search for talent by drilling down on location, industry, and keywords, and contact those that they’re interested in through mass InMails. Teams of recruiters from the same company can also manage the entire hiring workflow process and utilize collaboration tools to keep everyone on the same page. 2) Jobs Network: After listing the job posting on LinkedIn, recruiters can get a match of 50 strong candidates for the position. LinkedIn members can also see how they’re connected to the job poster as well as the number of people they’re connected to at the company. 3) Talent Direct: A slight variation of LinkedIn Recruiter, Talent Direct is different in that it allows a customized InMail to be sent to a highly qualified passive job seeker and appear higher and more prominent in the candidate’s Inbox. 4) Recruitment Advertising: Targeted banner-style ads on the main landing page to improve perception of employment brand. 5) Career Pages: A variation of the Recruitment Advertising module. Allows users to create a “Careers” tab to their main Company profile page and customize it to achieve their employment branding objectives. LinkedIn has the potential to broaden its scope of recruitment offerings by offering the following enhancements to its current portfolio. A lot of these require LinkedIn to embed advanced analytics into its algorithms with dashboarding abilities. Connections Added: Passive job seekers are generally looking to make a change when they’re starting to network with various professionals in their industry and add connections. A connection spike in the ‘Friend’, ‘Other’, or ‘Classmate’ categories vs. the ‘Colleague’ category would most likely point to a passive job seeker in the initial stages of his job search. Groups Joined: Joining groups within one’s industry, starting group discussions, and answering questions is another way to network and make oneself known within the community. Company & Department rating feature: Glassdoor already offers employees the ability to rate companies in terms of salary, their interview experiences, and their working experience there. Such a rating feature on LinkedIn (with a high level of data aggregation and anonymity in order to prevent employees from being singled out and being retaliated against) could help recruiters (as well as the company’s own HR department) gauge the willingness of a set of candidates to new opportunities. A ‘Department’ feature could allow employees to add themselves to a particular department within their company. The name of the department could be created virally, with subsequent profiles adding themselves to a department name that most closely matches what they type in when creating or updating their profile. Company Departures: The ‘Company’ feature on LinkedIn lists departures whenever someone changes their job title and company. Active job seekers could be given the ability to tag themselves as a potential candidate for that vacancy, with the tag only viewable to recruiters of the departing company who have purchased a Talent Advantage subscription. This would give such recruiters an active pipeline of leads to follow up on before even creating the job description for the newly open requisition. Following Companies: LinkedIn Users who follow companies generally do so because they’re interested in finding potential opportunities there. An “engagement meter” which records the number of blog entries, tweets, or company news that followers click on is yet another level of analysis that shows how interested a certain user is in the company. Online Presence: High quality candidates are bombarded with InMails all the time. A presence feature that shows whether a certain user is currently online, or predicts based on usage patterns when this user would be online again can enable recruiters to send their InMail either instantly (if the user is online) or at a specified time (based on when the next predicted online availability is). In summary, LinkedIn already has a great suite of products for recruiters to source quality candidates. By increasing the level of engagement with passive candidates, and mining some more nuggets of information about their LinkedIn habits (coupled with adequate privacy controls of course), LinkedIn definitely has the wherewithal to turn into the number one SaaS-style recruitment engine on the web today. Intel’s Conceptual Cloud Architecture placed an emphasis on certain components within the PaaS layer (specifically the database, analytics, reporting, and the workflow) as well as VM isolation, load balancing, and High Availability at the IaaS layer. The physical-to-virtual sizing strategy depended very much on the type of application being run. A small workload consisting of a basic web app server could achieve a virtual machine density of 22:1 using Intel processor Xeon 5500 based servers. A medium workload consisting of SQL database servers and Java applications could achieve a ratio of 11:1, while a large app consisting of several stacked applications could yield a 5:1 ratio. Private clouds are recommended for those applications that require high levels of security, governance, and interoperability such as ERP and BI, while public clouds are recommended for workloads that require rapid deployment, reduced capital expenditure, and external vendor expertise such as batch jobs, and HR apps. Intel’s cloud vision consists of a world where the cloud is federated, automated dynamically, and client aware to secure the most optimal experience across the client continuum. With the increase in cloud traffic, also comes an increase in cloud storage. Data was described into four different categories, each with its own associated CAGR by 2014: Structured Data (Traditional Enterprise DB, 23.6%), Replicated Data (Backups & Data Warehouses, 24.2%), Unstructured Data (Archives, 54.8%) and Content Depots (Web, email, document sharing, and social network content, 75.6%). There was also a feeling amongst respondents that cloud computing works for commodity applications but that complex integration requirements make costs skyrocket. The major sources of cost savings touted by cloud proponents involved three areas: efficiencies as a result of economies of scale, use of commodity gear and elasticity. This last area of elasticity is worth exploring further, especially in light of the number of respondents claiming to require excess capacity for their non-cloud computing applications, and the assertion that complex integration requirements are increasing the costs in the cloud. Elasticity refers to the ability to scale up or scale down on storage resources on the fly. But the reality of elasticity “on-demand” is that most major software vendors don’t provide the ability to add CPUs without additional costs, and coding applications that appropriately scale up are difficult. Thus, given the above data about the necessity of elasticity and the large percentage of companies that conduct detailed cloud ROI analysis, it is evident that these two factors are correlated. Massive improvements in the “converged fabric” architecture that brings together servers, storage, and networking, so that pools of additional capacity are easily available where elasticity is needed. During the recent recession, Cloud Computing was touted as a new model for IT to adopt, in order to cut operational costs and extract maximum efficiencies out of their software. 2010 was supposed to be the ‘Year of Cloud Computing’ yet adoption still remains slow. A recent InformationWeek article referenced a study conducted by Avanade which showed that 91% of U.S. respondents understood the term Cloud Computing while only 61% of respondents from the rest of the world understood it. Even more surprising was the fact that over half of U.S. respondents claimed to be using a combination of internal IT systems and cloud services (in other words “hybrid clouds”), while those who didn’t adopt any form of cloud computing cited security and control as their primary reasons for not doing so. Infrastructure-as-a-Service (IaaS): This includes servers, storage, and networking hardware stored remotely and delivered on an as-needed basis in the form of CPU cycles or data. Amazon EC2 and GoGrid are prime examples of IaaS providers. 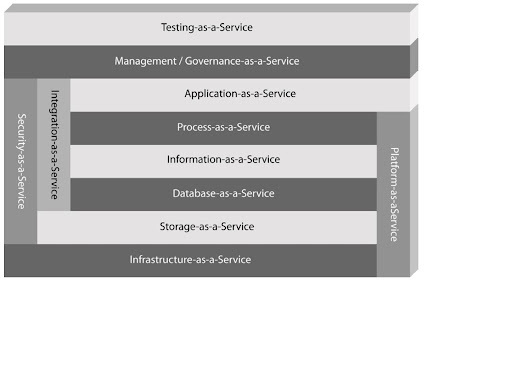 Platform-as-a-Service (PaaS): This consists of a complete platform upon which to build your custom applications. APIs, database development, storage, and testing are provided as well. Microsoft’s Azure and salesforce.com’s force.com platforms are examples of early PaaS providers. Software-as-a-Service (SaaS): This consists of applications delivered over the web and accessed through an internet browser. salesforce.com’s CRM modules, Gmail, and Workday are all examples of SaaS providers. However, as you’ll see below, there is a fine difference between a SaaS solution, and a SaaS cloud-computing solution. Although the above topology adds more granularity to the various components of cloud computing, it is sometimes too all-encompassing. For instance, the Application-as-a-Service segment (a.k.a. SaaS) consists of any software delivered over the web. But to be a true cloud-computing solution, I believe that such SaaS solutions must be able to not only integrate well with on-premise software but also with other SaaS solutions that exist on some other platform. The above list though, is not comprehensive. Moreover, current security solutions in the cloud are merely limited to security vendors that have SaaS extensions to their existing software. Security issues around protecting the platform in the cloud have not been addressed yet. A nightmarish security scenario would involve a hacker exploiting vulnerabilities in the force.com or Azure platform, and the virus quickly spreading to any applications that are run off it. Such a virus could then quickly proliferate its way to all customers using these applications. If you thought any of the MyDoom viruses of 2004 caused havoc, a virus of this scale through a cloud computing platform would bring significant business disruption. PaaS vendors such as Microsoft and salesforce.com need to assure customers of in-built anti-virus mechanisms to protect applications that run on their platforms. The Human Genome Project was first undertaken in 1990 and its goal was to understand the genetic makeup of the human species by mapping out the entire gene sequence. By some estimates, the HGP was completed in 2005. Genome assembly consists of taking a large number of DNA sequences and putting them back together to create a representation of the original chromosomes from which the DNA originated. Thus, as can be seen, this represents a huge computational problem due to the massive amounts of permutations and combinations that are possible. In fact, even the HGP was only completed using a “haploid” reference human genome and efforts are underway to extend this to “diploid” human genomes. While the terms “haploid” and “diploid” may be genetic gobbledygook, the point is that there are many “ploidic” ways to sequence genomes thus adding even more numerical combinations. So why would Google possible care about all this? Furthermore, where is the evidence that they do care about this at all? Firstly, Google has repeatedly stated that their mission is to “organize the world’s information and make it universally accessible and useful.” Secondly, Google’s co-founder, Sergei Brin took a minority stake in 23andMe, a company that aims to help you figure out your genetic code thereby sowing the first seeds of interest in the genetic game. Thirdly, as mentioned above, the HGP was only completed using haploid sequencing – Google’s powerful and speedy data warehousing algorithms could help perform such sequencing for the other “ploids” that exist. 1) Health: Google could send you alerts at particular points in your life if your genetic code shows that you’re predisposed to any sort of illness – this would serve as a constant reminder to get yourself checked by the appropriate specialist. Furthermore, you could also alter your diet and exercise in your younger years itself in order to prevent any health risks that you may endure later on in life, simply because of your genes. 2) Social Networking: Google could even act as the perfect dating service by monitoring genetic codes for any emotional or physical predispositions. The “perfect match” could in fact become reality! As well, it could also alert couples planning to conceive if there is a high chance of genetic defects if the child were to be born. Another application of Social networking in the realm of Health would be to help people find the right specialist – by showing how well rated a certain specialist is in treating a certain disease (obviously, this would be interfaced with Google Maps). As well, a person with a certain genetic defect could also find the right support network. The “killer application” of Social Networking and health would be the ability to locate the right bone marrow, the right blood type, or the right liver at the right place at the right time for transplant cases in a matter of minutes. As with every other issue to do with biometrics and genetics, there is bound to be a hue and cry over privacy and security. After all, identity theft is a huge issue and stealing one’s SSN can be a life changing event – what does one do when one’s genetic code is stolen? This is where “Google Gene” cannot simply consist of entering a password to obtain one’s data. Two factor authentication must be used in order to gain access to such data. The 2nd factor could be a person’s fingerprint on a USB-enabled reader. Facebook: Microsoft’s answer to software piracy? Microsoft loses millions of dollars every year to software piracy. The bulk of this loss can be attributed to illegal copies of its two bulwark products, MS Office, and XP, taking place mainly in developing nations such as India and China. Henry Chesbrough, the Executive Director of the Center for Open Innovation at the Haas School of Business at UC Berkeley, recently wrote about why Microsoft should welcome piracy in China. His reasoning focuses on the technology lifecycle and why it’s important to let new technology thrive in the early stages, even if it’s unlicensed. Just as an aside, the technology lifecycle consists of 4 stages: Creation, Growth, Maturity, and Decline, and these 4 stages are shaped almost like an S-shaped curve. When a new technology is created, it gradually rises in its Creation stage until it reaches the Growth stage, where it hyper-exponentially takes off. The Maturity stage represents the peak of the curve and maximum market saturation after which the technology declines. Chesbrough claims that given the currency differential between developed and developing countries, Microsoft should only capitalize on IP protection when technology reaches the Maturity stage, otherwise, the newly created middle class in China will simply use open source alternatives. George Ou of ZDNet disagrees with this and calls Chesbrough irresponsible for condoning piracy. As an alternative, he suggests selling Office and Vista for $3 each and ensuring that OEMs localize those particular versions of Vista and Office to be restricted to running in China. As an added incentive, he claims that people in China will want to buy these cheap legal copies because the illegal ones are full of malware. I agree with George that Chesborough was wrong in condoning piracy but disagree with his business model. I think that a $3 per copy fee in China versus hundreds of dollars per copy in the developed nations will only cause resentment in the developed world and serve to push them away towards open source alternatives. What do I think the answer to Microsoft’s piracy worries in China is? Facebook. Simply put, Facebook is the only social networking site out there today that validates the authenticity of a user by requiring him to provide a work or university email address. This minimizes the amount of multiple bogus accounts. Since the Facebook community is primarily full of college students, by using Popfly, a Facebook college user could leverage such content for a class project. 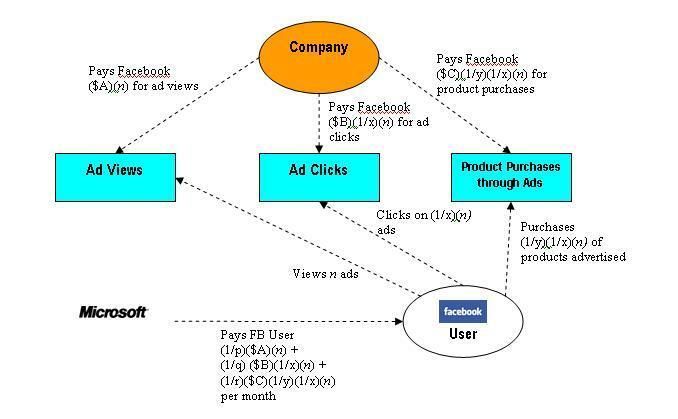 This advertising model would apply for an entire year so it’s to the user’s benefit to conduct all his transactions through Facebook to derive maximum savings on his Office purchase. Of course, if the total value of these discounts, ad clicks, and ad views equals the price of Office, then the monthly discount stops (i.e. the limiting factor is the zero value). Microsoft would obviously first have to lobby the Chinese government to ensure that Facebook adoption increases in universities across China. The Chinese government, being one that takes great pride in monitoring the activities of its citizens will only be too happy to oblige. The above mentioned model could easily be replicated in the enterprise, small-business and mid-market sectors as well (using work emails) which is where a lot of the piracy also takes place (I’m assuming of course that multinational enterprise companies conform to legal purchases).